One of the biggest challenges that Amazon sellers experience is how to move a product from an overseas location to a destination in another country. “International trade”. A concept ripe with opportunity, if one can nail down the logistics of moving products across international borders in a predictable and cost-effective way. Once a seller has found a product to sell and a manufacturer to make it, it’s time to figure out how to get it to Amazon’s warehouse for distribution. We were lucky to have the pleasure of hosting Nicola Malaney, FBA Manager at Shapiro, for a webinar on the gritty details of importing a product. Find your product using the Jungle Scout Web App today! Get comfortable with a notebook handy, her presentation is loaded with actionable takeaways to save you money and move your product with minimal hassle. There are some gems in here that can save you thousands of dollars, and guess what happens with that cost savings? Add it to your bottom line! From an importing perspective, there are certainly a few things to be aware of while you are sourcing your product and a supplier. Most importantly, you want to make sure you are sourcing from a reputable factory. One way to verify this is by reading through the Alibaba supplier reviews. One thing that you may want to be wary of is if your supplier has never exported to the US before. It is not necessarily a deal-breaker if they haven’t exported, but you will just want to do extra due diligence on insuring that they provide the proper documents for both export and import clearance. Ultimately, choosing a supplier that knows what they are doing when it comes to exports will save you time and headaches. It’s also important that your supplier understands what it takes to make their products compliant with regulatory bodies such as the Consumer Product Safety Commission. Imagine finding out that your goods have been detained because the lead levels in your children’s toys failed inspection….not a good start to building your Amazon business! If your supplier tries to tell you that US Customs doesn’t need certain information that your broker is requesting, or that you can claim a lower invoice value than what you actually paid, do some more investigation before committing to a purchase order. As the importer, you are ultimately responsible for the shipment, not the supplier. You want to make sure that the product you’re interested in is allowed into the US (or any country you wish to send goods to). It is a good idea to do this due diligence before you make any investments on your initial inventory. Furthermore, you’ll want to know which other government agencies, or OGAs, may regulate your product. US Customs are not the only ones interested in imports. There’s the Food & Drug Administration, United States Department of Agriculture, Environmental Protection Agency, Federal Communications Commission, the Department of Fish & Wildlife Services and the Consumer Product Safety Commission, just to name a few. You certainly don’t want to get too far along in the process before realizing you need a special permit, or worse, that the product is banned. One example Nicola has seen is sellers having to re-export items such as cosmetics, because the importers did not do the proper research on their items, and the FDA labeling requirements were not met. If your product makes any sort of claim regarding healing or curing, the FDA will consider this a medical device and the appropriate registrations will be required for import. You should also be aware of intellectual property rights. US Customs have recently taken an initiative to target violators more heavily. This means that any branded or trademarked products will require permission from the trademark holder if you wish to distribute it in another country. You don’t want to have to quickly learn how to export all the Disney merchandise you spent so long trying to import! Being informed is key to avoiding costly mistakes, so do your homework and don’t be afraid to ask your broker if something doesn’t seem right. Once you’ve chosen a product and a supplier, you’ll want to make sure you understand under which terms you’ll be paying your supplier. Incoterms, or terms of sale, play an important role in shipping, as they determine who is financially responsible for the goods at each step of the journey. Shapiro has a helpful infographic that makes it easy to understand. You’ll want to know what the price you’re paying your supplier includes. This is very useful when you are pricing out transportation, which is the next important step in importing: choosing your mode of transport! If you’re new to FBA, most likely you’ll want to test the market on your product prior to investing in shipping larger volumes. In most cases, using a small parcel courier such as DHL or UPS would be your best option. Shapiro can help you decide if you need a broker and freight forwarder, or if a courier would be a better option. In general, if you’re shipping less than 150kgs of goods and the commercial value is less than $2500, a courier can handle this for you without a problem. However, if you have high-value goods, or they are subject to regulation by a government agencies like mentioned above, the courier may require a broker like Shapiro to get involved in the clearance portion of things, while they handle delivery. 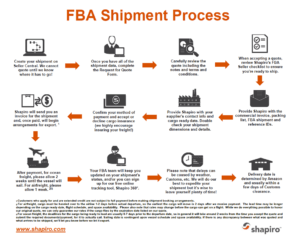 Shapiro handles various logistics solutions that are specific to the needs of FBA sellers, regardless of size of shipment. Before you can even start to price out shipping, you’ll need to head to Seller Central to find out where Amazon wants you to send your goods. There’s a high likelihood that they will want you to split your cargo up across several fulfillment centers and sometimes that alone makes using a courier more cost-effective. If you wish to avoid this, you can always opt in for Amazon’s Inventory Placement Program. In this program, Amazon will allow you to ship your goods to one warehouse instead of multiple, but there is a $0.30 per-unit fee for this. Once you know this cost, you can use this to perform a cost analysis of shipping directly to one warehouse, versus shipping to multiple. It is in your best interest to do a quick price check to see which is more economical for you. When choosing a mode of transport, the two main factors to consider are volume and speed. How much freight do you want to send, and how quickly do you want it to get there? In general, courier shipments are going to be the cheapest and fastest method, but only up to a certain size. After that, your options are air freight or ocean freight and for that, you need a freight forwarder who can properly route your freight and book space on a vessel or aircraft for you. So how exactly how do you choose a reliable forwarder if you’ve never done this before? This is the important question, as the quality of all the parties involved in your supply chain are equally as important. In general you want to look for a company that asks a lot of questions. The details matter here and if anyone is promising you otherwise, I’d think twice! If you’re not a seasoned shipper, you’ll want a forwarder who is experienced with new importers. Importing can be overwhelming and intimidating, and you want a company that will make it manageable for you, that will break down all the terminology and shipping lingo for you and most of all, keep you updated….frequently! Like in many things, with shipping you will get what you pay for, so if you’re looking for bottom of the barrel rates, you can expect bottom of the barrel service. Looking for a forwarder that also provides Customs clearance will reduce the amount of paperwork and coordination on your side as well. If your forwarder can provide you with easy to understand charts and checklists, that’s a good sign too. 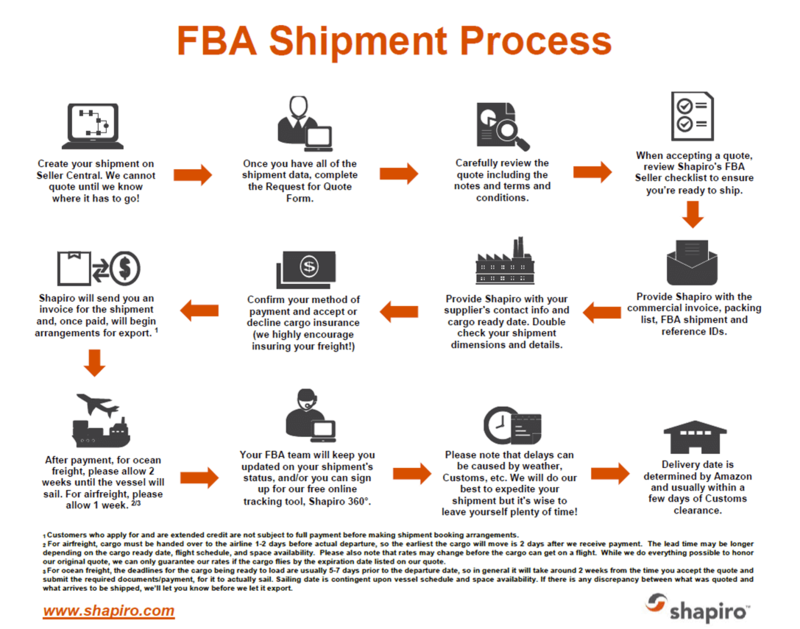 The above is the shipment process flowchart that Nicola presented. It illustrates the steps you would follow if you were using their forwarding services, all the way from creating a shipment, to accepting a freight quote, to Customs clearance and delivery. There is also a checklist that goes through both the forwarding and Customs side of things, to ensure that all the I’s are dotted and T’s are crossed, to minimize delays once the shipment gets underway. Check out slide 9 in the deck to see it. So once you’ve chosen your forwarder it’s time to decide the best method with which to ship your goods. There are two options: Air freight and ocean freight. In general, air freight will be more expensive because you’re paying for faster transit. There are direct and indirect flight options which may present more flexibility from a cost perspective but in general you can expect to pay more for airfreight. With ocean freight, you can choose how much cargo space you need, whetherless-than-container load (also known as LCL), or full-container load (also known as FCL). With LCL freight, your goods will travel along with other people’s cargo which is great as you can share the cost of the container. However, this mode does put you more at risk for Customs exams. If you’re able to get volume discounts from your supplier, and Amazon isn’t limiting your inventory capacity, shipping a full container may be a way for you decrease your cost per unit. Full containers come in several sizes, but the most popular are 20’ and 40’ boxes. In general, you’ll need a volume of at least 20 cubic meters to make shipping a full container worth it. Once you know where the goods have to go and have a rough idea of which method you’d like to ship by, then it’s time to get a freight quote. Now that you know how you are shipping, it’s time to get your pricing quotes. When getting your quotes, you may want to get different quotes, to compare air versus ocean, speedy or slow services or perhaps you’d like to analyze the cost-benefit of utilizing Amazon’s Inventory Placement Program. In this program for a fee, you can avoid Amazon splitting your cargo into 2, 3 or even more destinations which may provide cost-savings on the logistics side of things. Keep in mind that Amazon may still transship your goods to multiple fulfillment centers before making them readily available in the marketplace. In order to receive an accurate quote, you’ll need some specifics on your cargo. Just fill out a simple form that provides all of the details we’ll need to get you a customized quote. Flat-rate estimates are not a good idea when it comes to freight forwarding, so details matter…this relates to the size, dimensions, time of transit, etc. If you are planning to use a courier, pricing that type of transport is much simpler. To receive a customized quote, your potential company will need to know where they are collecting the goods, and that will depend on your terms of sale, or incoterms. For example, if you’re buying on FOB terms, or Free On Board, then your supplier is handling taking the goods to the nearest port and clearing Export Customs for you. If your terms are Ex-Works, the supplier relinquishes responsibility once the goods are packed and it will be up to you to get it picked up and exported. Amazon has very specific receiving requirements and Shapiro is happy to rework your cargo to configure it on the correct pallets to ensure proper delivery. In Nicola’s experience, most overseas suppliers are unable or unwilling to follow Amazon’s instructions. In order to provide pricing for this service, Shapiro, or any other reputable company, will have to know exactly what they are dealing with. In order to determine when your goods will be available to your customers you’ll need to consider a few different factors. There are a few elements of the import process than can cause delays. You’ll need to consider that Customs, and other government agencies may hold your cargo for document review or physical examination. This may cost you a few days, as well as a few dollars depending on the type of exam performed. As a new importer it would be wise to cushion a few days in your lead time to allow for an exam. Another factor outside of your control is the delivery date. Amazon designates the appointment and there is really no way to change it. It’s advisable that if you have urgent freight that you let your forwarder know as soon as possible. There are options for expedited services in most areas if time is of the essence for you. Another key factor will be the cargo ready date, and that will depend entirely on your supplier. For most ocean freight, there is one, or possibly 2 weekly sailings. Your cargo must be ready several days prior to the sailing date in order to make the vessel. So when you’re planning your lead times, consider that as well. The earlier you can communicate your delivery deadlines to your forwarder, the better they can help you make them! Regarding deadlines, it’s important to be aware that most ocean freight quotes are only valid for 30 days. Rates are always fluctuating so if your cargo is not ready to go by the time the quote is expired, you will need to update your shipping quote. Depending on the time of year, you could see some savings, but if it’s peak season, you could see increased costs. Airfreight rates are more volatile so the quotes are valid for even less time. Also understand that if you have a quoted delivery, those rates also may expire by the time the shipment is ready to take to Amazon and your forwarder can not always control that. The trucking market is becoming more and more unpredictable, you as the importer need to understand this premise and plan for it. After you have your logistics covered, it’s time to get ready for Customs clearance and the fun of paperwork! Whether you are a US resident or not, Amazon will not act as the Importer of Record on FBA shipments, which leaves you, the FBA seller, fully responsible for complying with US Customs (and other agency’s) regulations. Non-residents can certainly act as the Importer of Record for shipments into the US. Importing should be looked at as a privilege and not a right and although it can be tedious at times, all importers must be willing and able to provide any information Customs or government agencies require. In order to act as the Importer of Record, the first thing you’ll need to do is to purchase a US Customs bond. The bond, at its core, is essentially US Customs’ way of ensuring that they receive payment for duties and taxes on all imports. Shapiro offers an annual, or continuous bond which will allow you to import for 12 months. Shapiro discourages the use of one-time or single-entry bonds as it is generally not cost-effective and dramatically slows down the clearance process. Bonds are required for all sea freight shipments, even if the value is under $2500. If you ship with a courier, in most cases a bond is not required, however there are exceptions so we suggest checking with us before shipping anything. Along with the bond, you’ll need to provide Power of Attorney to enable us to perform Customs business on your behalf. They also have a terms and conditions of service agreement that they ask you to sign, and an optional credit application should you choose to apply. For any importers without credit, all costs for transportation, duties, taxes etc. would be due up front. After the initial onboarding paperwork is completed, it’s time to take a look at the commercial documents that pertain to your specific shipment. When you import to the US, you must declare the true commercial value of the goods you are intending to sell. Customs are very good at figuring out when merchandise is declared with too low a value, so please ensure your supplier is invoicing you for the actual cost of goods sold. Customs is not interested in your retail price. As the importer, you are held accountable for the shipment so any problems with clearance will be your responsibility. Not the supplier, not the forwarder, not even the broker, so it’s very important to trust the partners you are working with. The commercial invoice and packing list have several requirements, and Shapiro has a great blog post on how to create the perfect set of documents for your shipment. It’s best to be as transparent as possible as now when completing your commercial paperwork. Customs will be able to see your actual invoice rather than just the data as input by your broker. Ensuring that you have clear descriptions of your goods, and even photos is one way to minimize the risk of a Customs exam. Exams are generally the result of random inspections or when Customs isn’t quite clear on something on your paperwork. Some of the data elements required on commercial documents are the country of origin, terms of sale or incoterms, actual manufacturer’s name and address, gross and net weights and the currency used on the invoice. Don’t be surprised if your forwarder asks a lot of questions about your documents, as they are just trying to make sure everything is entered accurately and in compliance with US Customs regulations. You will want to note that all master shipping cartons should include the following data printed on the outside: Carton count, gross and net weights, country of origin and any tracking labels such as your FBA shipment labels. Boxes without these marking may be subject to markings holds at arrival, which will create a clearance delay. If you’re shipping on wooden pallets, you also need to ensure they are properly fumigated and stamped, otherwise the USDA will refuse entry. So just how much are Customs duties and taxes going to run you? That will depend mainly on your commodity, but also on a few other factors, including country of origin. Where your goods are actually made (not just shipped from) will determine if they are eligible for any free trade agreements, or are subject to trade regulations like Anti- Dumping Duties. Anti-Dumping Duties are high duties placed on foreign goods that have been priced below fair market value. You certainly want to be aware of these before committing to that product. A good example of this that Nicola mentioned would be colored pencils from China. Now that adult coloring books are so popular, colored pencils are in high demand. However, most will be subject to 114% duties, which can really throw you for a loop if you weren’t prepared to pay that much. Nicola encourages you to research duty rates with your broker prior to placing an order so that you can work those costs into your bottom line. Duty rates can be complex and you want a licensed broker classifying your products for you, not a random website. Many articles have low, or zero duty, but some, including textiles, can run as high as 20-30%. Again, quite of a lot of details may be required in order to provide the correct duty rate. Customs exams are an unfortunate reality when it comes to importing. Unfortunately, Customs does not disclose the examination information to the trade community due to national security risk. What we do know is that elements such as shipper, importer, tariff number, and country of origin are all taken under analytical consideration. Although some examinations are completely random, there is a track record that follows you and your supply chain. If you are a first time importer, Customs will likely examine your first few shipments in order to establish credibility. If you are a repeat offender of marking or labeling issues for example, beware that you will now be under the Custom’s microscope. x-ray exams are the least invasive and generally take place within 2-3 days of arrival. There are also tailgate exams, where Customs will open the container and take a look, but won’t open any boxes. These can take a bit longer. Intensive exams are the most invasive, as Customs will go through and open boxes and look directly at merchandise. Exam times vary port-port and also depend on how busy the Customs staff are, so unfortunately there is no standard and we recommend building in a cushion of at least a few days into your plans, and then being diligent with your Customs requirements and hoping for the best. The main reason for exams is protection, so while it can be frustrating and costly, it is all for good reason. How much will these exams cost you? It depends on the port, the type of exam and the amount of freight. Simple exams can cost as little as $50, whereas intensive exams can be in the thousands for a full container. The other cost to be aware of is storage. You’d think that the ports and the carriers would be understanding when Customs or another agency holds your freight for exam, but you’d be wrong. There are some cases where you’ll be charged demurrrage, better known as storage, even though you have no control over the fact that your cargo in unable to be picked up. It’s unfair, but it’s a fact and that’s why we want to prepare importers for this unfortunate reality. As importers, you are responsible for the costs associated with an exam, and Customs does provide a regulation spelling it all out. It’s the Code of Federal Regulations 19 USC 1467 and it states that ‘Customs and Border Patrol has a right to examine any shipment imported into the United States and it is important to know that you, the importer, must bear the cost of such cargo exams. The importer shall bear any expense involved in preparing the merchandise for Customs examination and in the closing of packages’. One great solution to staying updated on your shipments is Shapiro’s tracking tool called Shapiro 360 which will give you 24/7 access to the real-time status of your shipments. You can even contact your team directly from the site if you have questions, and you can run a lot of helpful reports on your cargo trends. Whether you are interested in how many times you got flagged for a Customs exam in a certain period, or help calculating your landed cost. It is a very user-friendly interface with reams of helpful information for sellers who are actively importing. So after your product has travelled halfway around the world, made it through Customs and now they just have to make it to Amazon’s door. It’s wise to understand how deliveries work, as that will allow you to identify events that may cause delays. Once the freight arrives, it will clear Customs and as long as there is no delay on the release, your forwarder will send a carrier in to pick the freight up right away. If you’re shipping with Shapiro, they have set everything up for a quick release, but if you’re using another forwarder, make sure that that they’ve taken care of all of their responsibilities so that you can get your freight collected as soon as possible. Keep in mind that during peak delivery times like the holidays, sometimes Amazon’s appointments are given as far as two weeks out. It’s not ideal, but it’s understandable considering how much freight they are dealing with during those surges. It’s imperative that you plan your holiday shipping with this in mind, as well as Amazon’s holiday deadlines which are generally 3 weeks prior to the actual holiday. For example, last year, December 4th was the deadline for Christmas. If you’re shipping LCL or FCL freight and not small parcel (with a courier), you will have to account for the time needed to rework your freight onto the proper Amazon pallets once the goods clear Customs. Shapiro’s warehouse partners, for example, work as quickly as possible, but it’s wise to have a good understanding of what needs to happen before the freight is Amazon-ready. Amazon requires most freight to be delivered on 48×40” pallets, with a height restriction of 72” and a weight limit of 1500lbs. If you have multiple FBA Shipment IDs, these cannot be comingled on the same pallet. You can see more about these requirements on Seller Central or by contacting Shapiro. Unless you are shipping a full truckload, or have elected for expedited trucking, your shipment will travel as LTL (less than truckload). Just like LCL ocean freight, your goods will be consolidated inside a 53’ truck with other people’s cargo. What does this mean for you? Well, if your cargo is not the first stop on the delivery route, there’s a chance that delays at other stops may cause the driver to miss the Amazon appointment. Amazon warehouses all operate under the same strict set of rules, however ultimately it is up to the manager on site to make final decisions in terms of accepting/rejecting deliveries. Shapiro has seen Amazon accept late deliveries (if given notice) and as well as seen Amazon reject a shipment if even a few minutes late. Importers need to be aware of this process, as something as arbitrary as a flat tire on a truck could ultimately affect your product’s availability. This is when you need a greater forwarder with good communication systems, so you can know exactly when these things occur and how the situation will be resolved. While most sellers are sending cargo direct to Amazon, there are some situations where you’ll be sending the goods elsewhere. Maybe you want to ship in bulk but Amazon has limited your inventory so some of the goods need to be stored elsewhere. Maybe you want to send your goods to an inspection center prior to shipping to Amazon. In these cases, we’ll need you to provide full receiving instructions for your ultimate destination. It is the responsibility of the seller to inform the forwarder of how other warehouse need their deliveries handled. If you’re not based in the US, Shapiro or your forwarder will need the tax-ID of the receiving location for Customs clearance purposes. They will also be asking you whether or not they have a loading dock, or if a pallet jack is required. Will an appointment be necessary? Is the delivery residential? If so, there is usually an additional fee. The details matter here as they want your non-Amazon deliveries to go just as smoothly as the Amazon ones! One additional step in the importing process is choosing where your goods are inspected. 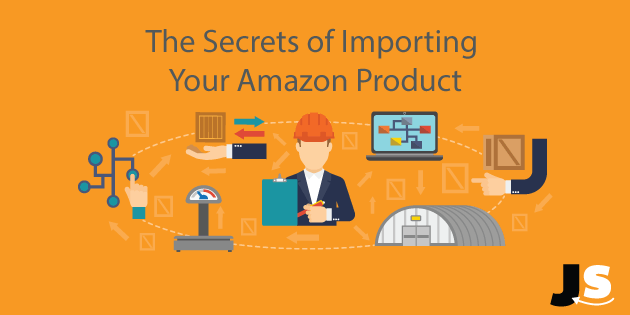 Sending your goods directly from the overseas supplier to Amazon can be scary, given that you have no real control over how the goods will turn up. There are a few different methods you can take to ensure that you’re getting what you ordered, and that your customers do too. You can start by asking the factory to send you a sample or two, or at the very least, photo verification of the finished and packaged product. This way you can check to see if they’ve followed Amazon’s requirements. If they are agreeing to palletize the goods for you, you’ll want to make sure they follow the policies exactly, to eliminate the risk of your cargo being rejected. If you still want more verification, you can choose to ship to a third party inspection center. There are plenty of them in the US, but that does build additional costs and time into your supply chain. Once you’ve had a few successful shipments, you can most likely eliminate these extra steps and streamline your operation while feeling confident that your customers are receiving the products exactly as you describe them on your listing. Two companies that Nicola mentioned are FBAInspection and EarthClassMail. Murphy’s Law: What Can Go Wrong When Importing? Clearly, there are a lot of contingencies when it comes to importing. It can save tremendous hassle and money to be as educated as possible on how the process works. Better yet, if you have a well-thought-out plan, you reduce the chance of delay and frustration. Freight quotes are only valid for 30 days, so make sure you are in sync with your supplier on this. Nothing is as frustrating as delays that happen before the cargo even exports! You’ll also want to understand how the exchange of ownership works. The Bill of Lading is a document that your supplier will release to you – to transfer ownership of the goods- after they’ve received your payment. For ocean freight, they can do this in two ways; the old school way, which means they issue original, carbon paper documents to you that you then need to endorse and surrender to the ocean carrier before they’ll release the cargo for pickup. Alternatively, they can issue an electronic release or telex, so everything is handled digitally and no originals are required. Shapiro highly recommends using the telex method as it’s far less of a headache! Original bills of lading are difficult and costly to replace so save yourself the hassle and elect for telex release. Be sure to know which method your supplier will use and give your broker this information as well. You have just invested some good money into your inventory. You don’t want to treat that lightly. Just what happens if the container falls overboard and your goods plummet to the bottom of the Pacific? If your goods are insured, you’ll be able to recoup the money you spent on the goods as well as what you paid for the shipping. If not, well, you’re out of luck. Most of the time, things go as planned but once in a while, things can go awry and you want to protect your investments by purchasing cargo insurance which will allow you to sleep a little better at night. Cargo insurance will not reimburse you for lost sales of course, but it’s much better than chalking it up to a total loss. Shapiro offers freight insurance and they can provide a rate at the same time we provide your freight quotes. Storage charges can occur when there are delays with the release of the bill of lading, or if other government agencies want to further review your shipment even after Customs releases it. Storage is generally priced by volume, and usually gets more expensive the longer the freight sits. All the more reason to have all of your ducks in a row and avoid this hit to your bottom line! Another form of storage that applies only to ocean freight is known as per diem. When you ship a full container, you are renting that container from the steamship line. Once the freight gets to the US and the container leaves the port for delivery, the steamship line will want the empty box returned quickly. If the container is dropped at Amazon’s facility, and Amazon takes their time unloading it, the steamship line will charge a per diem fee on the container, as well as the chassis it sits on. Amazon won’t be responsible for these charges. In this case, Nicola recommends transloading the goods out of the ocean container and palletizing the freight before delivery, so that the container goes straight back to the depot. Per diem can cost hundreds of dollars per day, so it can really add up. It’s also not a cost you’d necessarily factor into your bottom line, unlike the cost of transloading and palletizing which would be quoted before the shipment started. On the topic of delivery-related charges, it’s important to consider the trucking market. Recently the trucking market has become more volatile, meaning that you will want to make sure that you have the most updated quotes for cargo transit within the United States. Long story short, there was a labor strike on the west coast last year that affected the domestic trucking industry as well. As a result of some poor infrastructure planning, the US ports just cannot handle the volume of cargo entering the US, and the backlog can be catastrophic at times, as it was last year. The woes of the truck drivers made national news last summer and you might remember hearing stories about how the congestion was causing drivers to lose money. Drivers get paid by ‘turns’ and when there is congestion, they simply cannot make many turns per day as they are stuck in long lines at the pier. The only other way these drivers can continue to earn a fair wage given the circumstances, is to charge for wait time, much like a taxi driver charges you when you’re stuck in traffic. In general, drivers will allow 1-2 hours at port pick up and Amazon’s warehouse before they charge an hourly rate for their time. This charge is known as detention. It’s generally around $85/hour but it does vary by carrier. There are two types of unloading procedures the carriers provide; one is a live unload, where the driver will stay with the cargo until Amazon finishes unloading, and this is where detention is most likely to come into play. The other option is a drop delivery where the driver drops the load off and returns another time to pick up the empty container/trailer. This option involves two trips so is going to cost more, but it does minimize the likelihood of unplanned detention charges. When you are setting up your shipment in Seller Central, you will notice that Amazon provides 3 options for delivery type: Small Parcel, LTL and FTL. Small parcel is only to be used if you are using a company like DHL or UPS to send loose boxes. Amazon does provide preferred carriers for LTL and FTL as well, and you are free to use those for delivery however, these arrangements would be your responsibility and if you’re not familiar with the process, it may be a bit of a headache for you. Shapiro can handle the delivery for you and let you handle the rest of your business. Each year, Amazon publishes a calendar of deadlines for the holiday season. It’s generally about 3 weeks prior to the actual holiday, and not surprisingly, there is a mad rush to get freight into the warehouses at this time. It is therefore incredibly important to allow ample time to get your freight in for these peaks. Wait times for appointments can be as long as two weeks! We do recommend that if you’re worried about running out of stock, you supplement your freight shipments with small parcel deliveries with a courier service. After the holidays, another peak time for shipping will be the end of January, prior to the Chinese New Year holiday. If you are going to be sourcing in China, you need to be aware of this weeklong holiday where there will not be any aircraft or vessels departing China. You will most likely not be able to communicate with your supplier at this time either. The few weeks leading up to this holiday create a high demand for cargo space, which drives prices up and allows the carriers to have all control over what sails and what gets left behind. The big players (like Apple, Samsung, Walmart) usually buy up a lot of this space and therefore have an advantage over everyone else. There is always the risk that the carriers will ‘roll’ your booking to the next sailing to make space for the big guys. The moral of the story here is proactivity. So now that you’ve heard about the A to Z process of getting your goods to Amazon, we thought it would be useful to provide you with a few ways to manage your expectations by understanding the timeline of certain processes so that you can plan accordingly. Customs bonds can be ready within 24 hours of receiving completed paperwork and payment. As you can see, Nicola shared a tremendous amount of importing knowledge. The common theme throughout was simply being prepared, and understanding the process as best as possible, will help you avoid costly mistakes, and that partnering with the right providers will help ensure your imports and exports are handled with precision and care. Hopefully you are now armed with the knowledge to import in a smooth and cost-effective manner. You can learn more about importing with Shapiro on their website, or by emailing them directly at [email protected]! How you feel about this kind of shipment plan? Have you got any suggestions or advice for it? If everything sounds ok for you, can somebody recommend me some broker company? any idea how much it can cost me? Please help me should i change to another Shapiro vs. Courier? We are a books Distributor/ Reseller in Pakistan. According to our client requirements we buy a lot of books from Amazon, Abebooks and other book stores. Because the no. of books are high so we face difficulties to receive these books and due to bad postal system in Pakistan we lost a no of books. So we are looking a shipper/ agent who received our books and collect it and send to us as a collective consignment. I mean we gave his address as delivery address to Amazon he received books, collect them and then send these books to us in Pakistan. 1. MAKE SURE YOU HAVE A RAMP OR A FORK LIFT!!! If you are NOT discharging at an Amazon location make sure you have an unloading dock. IF NOT YOU NEED A RAMP! it is NOT impossible to unload, however if you have heavy cargo it will be a lot of up and down/on and off of the cargo container. 3. Double and Triple check that the freight forwarder (truck driver) has your cell phone number and vice versa. Google maps is NOT ALWAYS ACCURATE!! 4. Make sure you 100% double and Triple Check that the port of entry is correct!! This could be A MASSIVE MISTAKE!! For Portland Oregon and Portland Maine. COLOSSAL distance mistake that could instantly wipe out your profit. 5. Generally larger importers have Amazon experience as well. The rates are substantially cheaper and just as professional. HOWEVER, use your brain, If the company makes you feel sketched out….9 times out of 10 follow your gut. I can’t explain how awesome the feeling is when you get your first shipment. It seems overwhelming but it really is nothing more than understanding the Protocol. Good Luck Everyone ..and if you’re gonna be a bear…..be a friggin grizzly! If you have any questions please feel free to ask ! Best of luck to all!